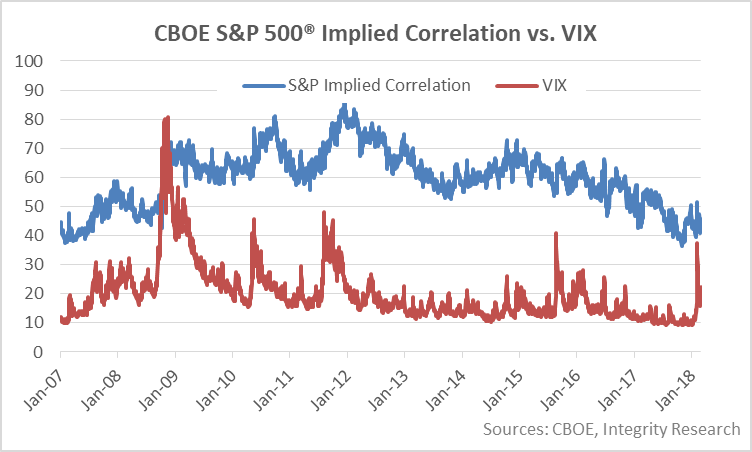 Increasing market volatility as measured by the VIX has not materially changed the correlations between stocks, preserving a benign environment for fundamental equity research providers, especially those affiliated with cash equities brokers benefiting from the spike in trading levels. For macro research providers, the news is not so good. The CBOE S&P 500 Implied Correlation Index, which is based on the S&P 500’s top 50 companies, shows continued low levels of correlations between stocks, ranging between 40% and 50%, down from nearly 90% during the peak of the crisis. The closing value Friday for the January 2020 futures contract was 43.6%, remaining at 2007 pre-crisis levels. Low correlations between stocks benefit stock pickers as stocks are less likely to move in lock step as they did during the financial crisis. Conversely, the lower correlations are less welcome for economic research and investment strategy firms because they signal that macro policies have less sway over markets. Nearly half or 48% of actively-managed funds beat their bogeys last year, the highest hit rate in eight years, according to a recent Bank of America report. Hedge funds posted positive returns in every month during 2017, the first perfect calendar year since 2003, according to Hedge Fund Research. The HFRI index for equity hedge funds was up over 13% for the year. Equity hedge funds increased [ResearchWatch subscription required] their assets under management by 37% in 2017 in 2017 according to BarclayHedge. Despite the improved environment for active managers, few are predicting that the trend toward passive investing will cease. According to Morningstar Direct, passive US equity funds experienced over $200 million in inflows during 2017 while active US equity funds had $200 million in outflows. Nevertheless research providers will take comfort where they can find it, and the current uncorrelated market conditions are a welcome wind to the back.